An 8 year-old female neutered Staffordshire Bull Terrier was originally referred for episodes of sporadic fainting/collapsing. During these episodes, bradycardia was detected (40 beat/minutes) with sinus rhythm. The patient was diagnosed with Diabetes Mellitus at the referring vet 8 months previously, the dog has been of 8 UI of pork insulin twice day. The owners reported the dog is still poliuric and polydipsic. The physical examination was unremarkable. Neurological assessment was unremarkable. Haematology was unremarkable. Biochemistry revealed mild hyperglycaemia (15.5 mmol/l), mild hypercholesterolemia (7.1 mmol/l). Fructosamine were mildly elevated (541 umol/l). NIBP was 130 mmHg. Urine analysis revealed 1002, with unremarkable sediment and negative culture. Thoracic radiographs and abdominal ultrasound were unremarkable. Cardiac ultrasound was unremarkable. The patient was hospitalised for blood-glucose curve to detect a possible iatrogenic hypoglycaemia and for 24-hour holter monitoring. 24-hours Holter monitoring was unremarkable. The nadir of plasma glucose was 4.6 mmol/l. This was considered low for a dog on insulin treatment but not very likely to be the cause of fainting/collapsing episode. The finding of hyposthenuric urine with history of pu/pd was suspicious of diabetes insipidus. The patient did have one of these “episodes” in the hospital. The heart rate was around 40 beat/minute during the episode with plasma glucose of 17.7 mmol/l. This ruled out hypoglycaemia as the cause of the fainting episode. The episode was recognised as narcoleptic episode. At that stage a hypothalamic problem was suspected as the dog showed signs consistent of diabetes insipidus, narcolepsy and bradycardia not cardiac in origin. MRI of the brain was performed. It revealed a cyst-like lesion in the sella turcica between neuro and adenohypophysis (see picture below). CSF collection was performed. The CSF was unremarkable. 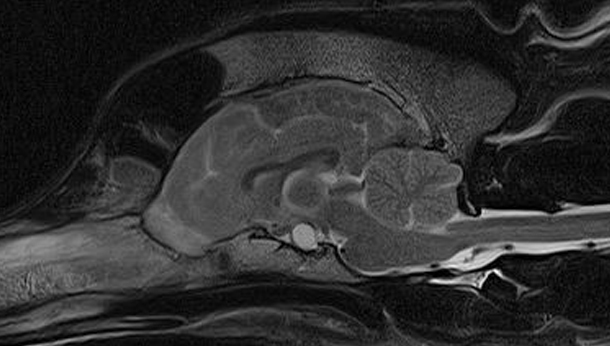 The diagnosis was hypothalamic cyst with secondary diabetes insipidus, narcolepsy and bradicardia. The patient was started on vasopressin and clomipramine. She responded very well the pu/pd resolved as the narcolepsy. The dog is still alive 14 months after the diagnosis. Click here to find out more about our internal medicine service.